Get Vendio Gallery - Now FREE! Network Cabinet 24U 600x600 FLATPACK. Dimensions(HxW xD): 1163x600x600 mm. Front Door: Glass door with metal sides and three-point rod-latch lock with swing handle. Rear Door: Solid steel door with single-point lock. Surface finish: powder painting in colour light gray RAL7035. 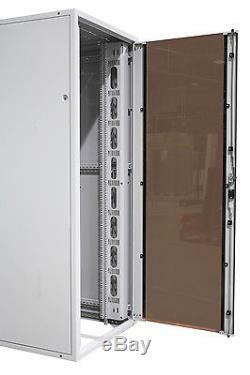 Vertical cable management (available only in 800mm wide cabinets). 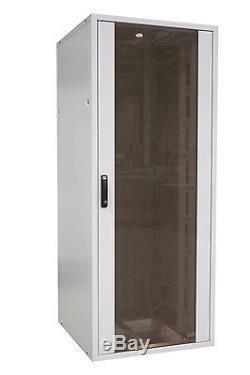 World's most versatile rack enclosure for demanding IT environments. SZBUK provides a reliable rack-mounting environment for network equipment. Stable, bolted construction - will secure your equipment. Glass door - enables easy monitoring of installed equipment. Lockable doors and side panels. Removable doors and side panels for easy access. 2 pairs of 19 vertical mountin profiles with U numeration - perfect for networking, servers, Audio-Video and CCTV installations. 1000 kg of maximum load - for maximizing space usage. Knock-out blanking plates in top plate and large openings in bottom plate for cable entry - you can easily lead out cables. Variety of additional accessories - you can configure your cabinet as per your needs. Adjustable mounting profiles to optimize depth. 4 leveling feet - suitable for any type of floor. 19 RACK ADJUSTABLE SHELF 350-600 STRONG SHELVES GREY. Suits all 19 racks Stable construction - will secure your equipment up to 150kg Excellent ventilation for maximum airflow Supplied with fixing accessories, ready to mount. Colour: Light Gray [RAL 7035]. POWER STRIP WITH 6 UK SOCKETS. 19 CABLE MANAGEMENT BAR GUIDE 1U GREY. Catalogue number:WN-811-100 Height: 1U 5 cable plastic clamps Use: 19 rack Material: 1,5 mm Sheet steel bar, plastic clamps Surface finish: Powder painted GRAY. VOLTAGE DISTRIBUTION PANEL PS-3U WITHOUT ELECTRICAL EQUIPMENT. Catalogue number: WZ-PS3U-00-00-01 Dimensions (H x W x D): 133 (3U) x 446 (19") x 60 mm Material: 1.5 mm thick powder painted steel RAL 7035 Use: 19" rack Surface finish: Powder painted GRAY. Catalogue number: WZ-SB00-49-01-011 Dimensions[HxWxD]: 2U 446x650 Maximum load capacity: 25kg Material: 1.5 mm thick sheet steel textured powder painted in GRAY [RAL7035]. HEAVY DUTY CASTORS SET - NETWORK CABINET 800MM. NEW UNI RACK SHELF 19 FIXED SHELVES 1U 465x650 GREY. 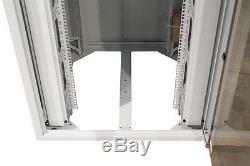 Dedicated for 19"mounting profiles in rack cabinets and open racks Fixed on four 19" mounting profiles. Fixing to the side openings GRAY powder paint coated shelf Usable depth: 650 mm Supplied with fixing accessories, ready to mount Mounting height 1U. ROOF FAN TRAY 2 FANS GREY. 45 dB Colour: Light Gray [RAL 7035]. 6 WAY ROOF FAN TRAY FOR 19 ASEMBLY. Authorised Economic Operators "Secutity and Safety" (AEO-F) ISO 9001 and 14001. All our products are new, original and packed. P: 01707 327 316 M: 0784 267 4344. ZPAS Ltd Unit 4 Mundells Court Welwyn Garden City AL7 1EN United Kingdom. Company registered in England and Wales. HSBC bank accout sortcode: 400216 acc. Invoices are sent on request. Use the FREE Counters 1 million sellers do - Vendio! The item "SZBUK 19 Data Comms 24U 600x600 SERVER RACK NETWORK CABINET" is in sale since Friday, June 17, 2016. This item is in the category "Computers/Tablets & Networking\Enterprise Networking, Servers\Racks, Chassis & Patch Panels\Rackmount Cabinets & Frames".group" and is located in Welwyn Garden City. This item can be shipped to United Kingdom, Ireland.